SAN FRANCISCO -- How hard can kicking a soccer ball on rollerblades be? Turns out, as my sister and I both found out, it's pretty tough. 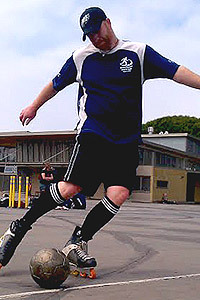 During a rollersoccer scrimmage in San Francisco, I hoist myself up off the ground in slow motion, sporting two bloody elbows and a notion that I broke my tailbone. Co-owner and league president June Solomon instructs me once more: Keep my knees continuously bent and maintain an equal weight distribution at all times. Stay low, if only so the fall will hurt less. Rollersoccer games feature two 25-minute periods, played on a hockey rink-sized space with goal posts three meters apart and one meter high. Goalies cannot use their hands, only their legs, to stop the ball. All-Stars like Peter Fitch and Lemuel Haham are far more deft than me, gliding around the court with the ease of Alexander Ovechkin or Michelle Kwan. They can dribble on their rollerblades, float through defenders, and one Brazilian star even scored a goal off a bicycle kick. I ache head-to-toe and look like a baby donkey ice skating. "Being able to stop and trap the ball is the best skill -- and changing directions like a squirrel," skater boy Dustin Dettmer, a software programmer from Mountain View, Calif., noted as I hear screams from my sister, having just face-planted. "My first kick!" my sister Kristy blurted out, exasperated and whisking rocks off her knees. "And my wheels went over my ball and boom! Just like that." Kristy Barry Will Nelson, also known as "Buffalo," displays his impressive form. The timing is tricky, gauging where you are as well as where the person you're passing it to will be. Anticipation is everything. Rollersoccer rules prohibit checking or slide tackling and color cards are given to penalize bad behavior. "There's enough head-banger sports out there, we don't need to turn this into ice hockey," quipped Zack Phillips, who created the sport after the idea struck him when a soccer ball rolled in his rollerblading path in San Francisco's Golden Gate Park. It is now played in 30 countries and counting. "We try to focus more on skill, not physicality," he explained later. "It's an equalizer between the sexes; it's not gender or size, it's pure skill at an intense pace. If you're good, you play." Phillips' full-skull tattoo of a soccer ball is a testament to his dedication. He met Solomon, his wife of 10 years and fellow teammate, at a rollersoccer event called "Skate of the Union" in Washington, D.C., in 1998. Now they travel around the globe, working tirelessly at promoting the quirky sport with international appeal via networking, events and youth programs. At the World Cup in South Africa last summer, the couple competed in Cameroon with a newly formed team there. "They don't have a lot of smooth surfaces and wore old skates, but they made the best of everything," Solomon recalled. "And they were awesome. So dedicated, all 20 skaters, mixed male and female. People find the sport and fall in love with it despite their circumstances." Rollersoccer is hard to get used to, but it's easy to become addicted. Sidelined, I was plotting what went wrong, where to position myself, how to move with the ball once I hopped back in. Sore, sweating and scraped up, I felt the itch to play again and get more wide-eyed revelers involved. Or just brag to friends. "All the cool kids are doing it," Dettmer chuckled. Slovenia, Belgium and Italy took top honors at a Rollersoccer Euro Cup Championship in May in Amsterdam. The San Francisco team will be in Recife, Brazil, from Aug. 25-28 to compete and defend their crown in the 2011 Rollersoccer World Cup.